Every morning, like many of you, I open my e-mail and groan: so much spam, so many unwanted messages and advertisements. It makes you want to kick the computer. But there's one item I never skip. In fact, I welcome it every day in my Inbox -- and that's APN's News Nosh. It's the very best available source of information about Israel/Palestine. Orly Halpern, a brilliant journalist in Jerusalem, excerpts the news from an array of Israeli newspapers from left to right and gives it to us in a concise readable format. I don't read every article, but those of special interest to me are right there in my inbox every morning. Orly is on the scene,­­ so by the time I get to my computer in the morning she has already posted News Nosh and I start the day with information that hasn't even made it to the daily newspapers here in the States. I know she's reliable. I count on her to keep me educated when increasingly we are subject to blatant distortions and rhetoric cranked out by apologists for the Israel-right-or-wrong narrative. A look at any day's News Nosh reveals an incredible number of articles about developments that we in the US know little or nothing about. I am a voracious reader of newspapers here but didn't know that a Palestinian activist who went to the Haifa police station to help his son arrested for participating in a demonstration was himself taken into custody where his leg was broken. A video of the father going into the police station showed him walking normally. The leg-breaking was done by the police inside the station. Would you and I have known about the incident without News Nosh? I think not. After excerpting the headlines, Orly Halpern provides an analysis of important newsworthy events. That's where I learn about the news behind the headlines. She sometimes injects her own editorial comment such as when Ambassador David Friedman said "Moving the US Embassy to Jerusalem will deprive the Palestinians of one of the stumbling-block issues and hence bring peace to the area," and Orly wrote "You've got to be kidding!" Here's the value of News Nosh in a nutshell: to take action in support of the Israel I know and love but worry about ceaselessly, I have to know what's really going on. 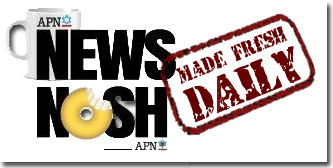 If you love Israel but hate the occupation, the anti-democratization, and the creeping annexation which characterize the policies of Israel's current government, subscribe to APN's News Nosh. It's as essential for your activism as a good breakfast is for your health.